Saturday’s Temple Stakes at Haydock has long been recognised as one of the key sprint races of the season. Past winners include Sharpo, Never So Bold, Mind Games and Dayjur. 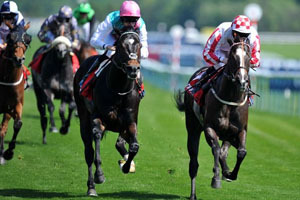 Last year the race was won by Roger Charlton’s Bated Breath in a new course record time from the fast-finishing Sole Power. The runner-up was bidding to win the race for the second consecutive season having been successful in 2011. Bated Breath has now been retired but Sole Power is back and in terrific form as he bids to go one better. Sole Power put in two fine efforts in Meydan in the spring before being produced for his characteristic late burst by Johnny Murtagh to win the Palace House Stakes at Newmarket. He had several of Saturday’s rivals behind him on that occasion, notably Kingsgate Native and Tangerine Trees who filled the minor placings, and looks a firm favourite at 11-4 with Bet365. Kingsgate Native is another past winner of this event but has never been the most consistent of sprinters. He was formerly trained by Sir Michael Stoute but is now based with Robert Cowell and that was a most encouraging seasonal debut. Cowell also has a second string to his bow in the form of Spirit Quartz. He ran some fine races last season including finishing second in the Group 1 Nunthorpe Stakes at York. He has a little over three lengths to make up on Sole Power from Newmarket but he was off the pace from his wide draw that day and could finish closer. The title of Champion sprinter is very much up for grabs this season and there are two promising candidates in Reckless Abandon and Pearl Secret. The latter lost his unbeaten status in the Nunthorpe last season but had previously looked like being a major force in the top sprint races. He could certainly be a threat with another year on his back whilst Reckless Abandon represents the three-year-olds. Connections resisted the temptation to stretch his stamina beyond sprint distances following Group 1 victories in the Prix Morny and Middle Park Stakes as a two-year-old. He fought back bravely to win at Newmarket to remain unbeaten as a juvenile and he certainly has the potential to go right to the top this season. This race looks an ideal opportunity to find out where he stands against the older generations. Swiss Spirit finished out of the money in the Duke of York Stakes last week but is capable of better. His best form has come on a faster surface and he was not beaten that far at the Knavesmire. The going could be key to deciding the winner of this race as Sole Power definitely likes to hear his hooves rattle. The going is currently good with showers forecast for the weekend.